A son, Cnut, was born to Sweyn Forkbeard and his wife, the Polish princess, Gunhilda. Cnut’s father, Sweyn Forkbeard and his ally Olaf Trygvasson sailed up the River Thames and put London under siege. King Aethelred was forced to pay them £16,000 (5.3 kg of silver) to make them leave. Cnut’s brother, Harald, was born to Sweyn Forkbeard and his wife, the Polish princess, Gunhilda. Cnut’s father Sweyn defeated and killed his Norwegian rival Olaf Trygvasson and took control of Norway. Cnut’s father, Sweyn Forkbeard, made a series of raids along the South coast of England. King Aethelred ordered the massacre of all Danes living in England. He hoped that by ridding England of Danes he would minimise the risk of attack from within. A significant number of Danes were killed including Cnut’s aunt Gunhilde, the sister of Sweyn Forkbeard. Cnut’s father, Sweyn Forkbeard and a party of Vikings raided the South coast retaliation for the St Brice’s day massacre. They gained control of land from Exeter to Hampshire. King Aethelred was forced to pay Sweyn Forkbeard £24,000 (8kg of silver) to make him leave England. Cnut’s father, Sweyn Forkbeard returned to England and destroyed the town of Norwich. Cnut’s father, Sweyn Forkbeard and the Vikings returned to England and made a series of raids on Kent and Sussex. King Aethelred of England was again forced make another Danegeld payment of £36,000 (12 kg of silver) to make the Vikings leave. Cnut accompanied his father, Sweyn Forkbeard to England where they took Wessex, Mercia and Northumbria. London alone held out against them. Cnut met Aelfgifu, daughter of the former ealdorman of Northumbria. They were married soon afterwards. It is likely that they married by Danish custom of handfasting. Having conquered the majority of England Sweyn Forkbeard proclaimed himself King of England. King Aethelred, Emma and their children fled to Normandy. Sweyn Forkbeard died possibly following a fall from his horse in Gainsborough. He nominated his son, Cnut to succeed him. The English nobles were not happy about having Cnut as King and so called for King Aethelred to return as King. The people of Lindsey, however, gave their support to Cnut. Cnut returned to Denmark to raise an invasion force. A son, Sweyn was born to Cnut and Aelfgifu daughter of the Earldorman of Northampton. Cnut was determined to take the English throne and invaded England with a large Danish force. A son, Harold was born to Cnut and Aelfgifu daughter of the Earldorman of Northampton. Cnut took Northumberland then marched towards London. King Aethelred died, He was succeeded by his son, Edmund Ironside as King Edmund II. Cnut’s force was defeated by Edmund Ironside. This battle fought between Cnut and Edmund Ironside saw the Dane victorious and left Edmund in control of only Wessex. King Edmund had no choice but to agree to share rule with Cnut. Cnut ruled Northumbria, Mercia and East Anglia while Edmund ruled Wessex. It was agreed that on the death of either party the other would rule all of England. Edmund Ironside died and Cnut seized the throne of England. Edmund Ironside’s two children were taken to Hungary as it was feared that they would be murdered by Cnut. The three children of Aethelred the Unready by Emma of Normandy were taken to Normandy as it was feared their lives were in danger. Cnut divided England into four earldoms: Wessex – controlled by Cnut himself, Mercia controlled by Eadric Streona, Northumbria controlled by Erik of Hlathir and East Anglia controlled by Thorkell the Tall. Cnut was crowned King of England at St Paul’s Cathedral. Cnut married Aethelred’s widow, Emma. This was a political marriage to gain the support of Normandy as well as the English over whom Emma had been queen for the last 15 years. It was agreed that the succession would be with the children of Emma and Cnut. Cnut had the Earl of Mercia, Eadric Streona executed for treachery. He was replaced by Leofric. Cnut collected a Danegeld from the Kingdom. The sum collected, more than £80,000 was used to pay off his Danish army and send them back to Denmark. A son, Harthacnut was born to Cnut and Emma. 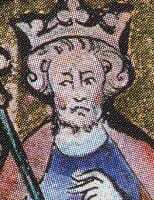 Cnut inherited the throne of Denmark when his brother, King Harold, died. Earl Godwin, the most powerful noble, allied himself to Cnut by marrying his sister in law, Gytha. Cnut went to Denmark to claim the Kingdom. A daughter, Gunhilda, was born to Emma and Cnut. Thorkell the Tall fell from favour and was exiled. The exact reason for his fall from favour are unknown. A combined Norwegian and Swedish force launched an attack on Denmark. Cnut responded by sending a combined English and Danish fleet. Despite heavy casualties the battle was won by Cnut. Cnut became King of Norway. He was now King of England, Denmark and Norway and became referred to as Cnut the Great. Cnut left Hakon Eirksson as regent in Norway. Harthacnut, son of Emma and Cnut, was made regent of Denmark. Earl Godwin was given control of Wessex. Cnut’s regent in Norway, Hakon Eriksson, died. Cnut named his eldest son by Aelfgifu, Sweyn, as King of Noway and sent him and Aelfgifu to Norway. The rule of Aelfgifu and Sweyn in Norway had not been popular. They had tried to introduce Danish laws to Norway and and imposed heavy taxation. The people of Norway rose against their rule and they fled to Denmark. Magnus the Good took over as King of Norway. King Cnut died. He was succeeded by his son by Emma, Harthacnut, who was in Denmark as regent.